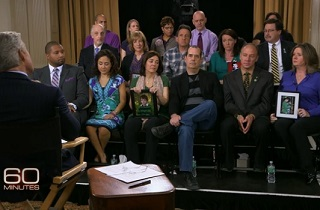 (Mediaitie) -- As parents of the children tragically slain at Sandy Hook Elementary School prepared to lobby Congress for gun violence prevention measures on Monday, CBS News’ 60 Minutes aired a powerful interview with seven of the families Sunday night, all members of the group Sandy Hook Promise. Many of the parents spoke wrenchingly of the moments leading up to the discovery of their children’s fates, and discussed what they would like to see happen on Capitol Hill. While background checks seem to have the most public support, it was magazine sizes that many of the Newtown parents saw as most important.